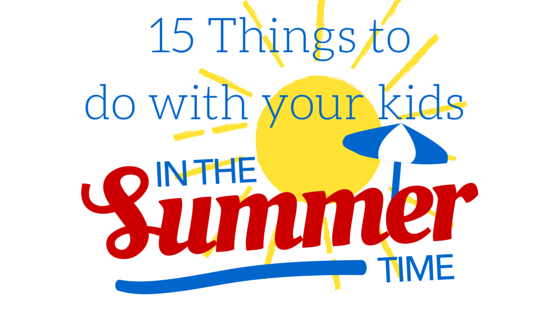 Are you struggling trying to find things to do with your kids in the summer time? What better way to kick off the last days of summer vacation than throwing a backyard party with your kids? Turn your backyard into an obstacle course. This project is a super fun way for the kids and adults to get a little exercise and you can use the stuff you already have out there! Flip over those lawn chairs and crawl under them or jump over them or run around them. You get the idea. Whip up a batch of “no pop bubbles” and see if they really are as good as they claim to be. Build a bonfire & roast hot dogs for dinner and follow up with s’mores for dessert. Spray paint a twister board onto the lawn and see how flexible you really are. Introduce games that you used to play when you were a kid! Anyone up for a game of kick the can? Summer is the time to sneak a drink from the garden hose, get dirty.. laugh! Did you try any of the activities from last week? Join us next Friday for Part 10 of our “15 things to do with your kids in the summer time”. We will be ramping down the last two weeks with something a little different so make sure to comment on what your favourite activity has been during this series. Your families favourite just might make our list! We just may have a pajama day tomorrow! What a cute idea! Thanks for the activities! Love the idea of making body scrub. My boys would love the video game marathon. They would play 24/7 if I let them. Great list of activities and I cannot believe summer is nearing a close – when Labor day rolls around I feel ready for fall. Those are great suggestions! My son would love to try some of those activities! Thank you for sharing them! Making body scrubs sound like a great activity to do. it will allow them to customize their bath time. Red rover! Oh man. That was one of my faves as a kid! I love it and know my kiddos will too. Great list. Again another great list. We are visiting an historical site this week. Fun list of things to do this week. Isa woudl enjoy making some body scrub. I wished I would have started reading this earlier this summer. If I had a dollar for every time I heard I am bored, I would be a wealthy lady. I use your list every week! This week I’ll work on our herb garden because there are so many things popping out right now! And Pajama Day sounds perfect. We’re doing that today. You are just full of great ideas! I am definitely going some of these. I tried to get all of my kids to likeAggravation. Not one does, lol. Sillykids. That’s a fun game. Those are great suggestions! My boys would love to launch a rocket! Hands on fun! What a fun list to end the summer with! Wishing I had a drone now, too, so that I could take cool pics! These are such fun ideas. I love the variety! Way to keep the kiddos entertained all summer long. I love the idea of a pajama day! Relaxing for the whole day in comfy jammies before the onslaught of the school routine! We live in our jammies in the summer! Another great list, you have come up with a lot of good ones! What great ideas and I especially love the obstacle course one. The kids are always wanting me to make one for them and I love to get creative with play. Thanks for the tips. Love these list of ideas/ We played kick the can growing up. Such a great list and so many good ideas! Lots of ways to keep busy! These are wonderful! I think pajama day sounds like a lot of fun. Just laying around all day watching movies. We haven’t done of any of these recently, but this reminds me of a historical site not far from our home. We haven’t been in a few years, so maybe we can fit it in before school starts! Wow this list is keeping us busy and having fun this summer. Great list of activities.